Home Blog Is your MFC displaying/outputting a flow signal (or negative flow) with no gas going through the device? Close a downstream shutoff valve and open the MFC valve using a setpoint or valve override (VOR) open command. This will fill the lines up to the shutoff valve and pressure will equalize across the MFC. For digital devices, press the zero button until the LEDs indicate the device is re-zeroing. The LED indicator turns green when the zero process is complete. PV signal should be at zero. Repeat if necessary. 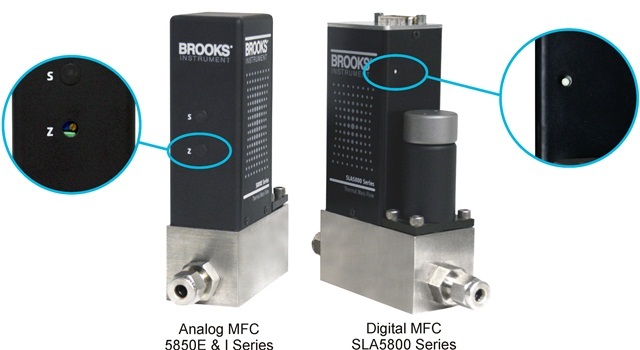 Alternatively, digital devices can be re-zeroed using service tools (BSS or BEST) from Brooks Instrument. For analog devices, monitor the output signal and adjust the zero potentiometer until zero is achieved. Open the downstream shutoff. Monitor the PV for any flow indication. If you are seeing flow, this could be the valve leak-by as described above. Brooks Instrument MFCs are zeroed at the factory. An initial zeroing may be necessary upon installation. By setting up the device, as outlined in the first five steps above, you can determine whether an initial zeroing is needed, or if it is good to go. If you need assistance please contact our Technical Services team or your local Brooks Instrument sales representative for assistance.